4- If using a condenser microphone, make sure you turn on Phantom Power. PUSH and HOLD the Trim button repeatedly, until the light with the 48v label turns RED. 5- Make sure the PAD lights are off. If they are GREEN, PUSH and HOLD the Trim button a few times more until they dissappear (but the 48v must still be RED). 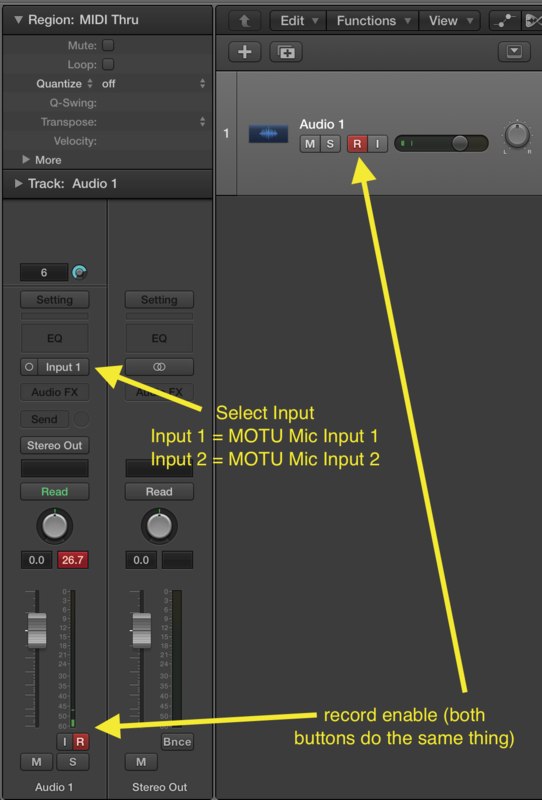 7- Create a new track and select "Input 1" or "input 2", depending on where you plugged in your mic. 8- Make sure the Main Fader (labeled "Front Speakers") on the mixer is completely down. Make sure, however, that the faders on the mixer labeled "MOTU 828 Main L-R" are between -10dB and "U" (see "Multi-Channel Audio" section on website for more about outputs). 9- Press the "record enable" button - it will turn red and start to blink. You should now see some activity on meters of the track. 10- SET YOUR LEVELS! Look at the meters and adjust the Trim dial on the MOTU 828 until the loudest parts of what you're trying to record hits about -6dB. Avoid clipping as much as possible (i.e., you should never see the top of the meters turn red). 11- Record a test sound - Press the record button. Once done, press stop or spacebar. IMPORTANT: if your recording is very quiet, DO NOT simply raise the faders on the mixer. You MUST raise the trim on the MOTU and re-record. 13- Repeat steps 8-12 until you are satisfied with the sound and then record your source.